Following unfavourable weather conditions the previous weekend, the Amateur Radio Experimenters Group planned a second attempt to fly the science payloads for the Southern Hemisphere Space Studies Program 2018 on Sunday February 4th. Again, the weather was not cooperating, which forced a change of the launch site in order to get off the ground. This meant a very early start as the launch teams left Adelaide at 7.00am to trek 150km east of the city into the Murray Mallee. This flight was carrying a number of science experiments for the SHSSP students. This year the focus was on space navigation, so one particular focus was using the GPS data coupled with an initertial measurment unit to be able to plot the angle and direction of the camera taking the photos. The other experiment was a spectrometer which was measuring the precise wavelengths of light. Launch preparations began about 9am after the crew had arrived at the launch site. Thanks must go to Chris VK5CP who arranged access with the farmer who’s paddock we borrowed for the morning. Along the way the obligotory bakery stop had been made in the township of Mannum (I can vouch for their blueberry scrolls). Today we had a couple of new faces on the flight team, with Marcus VK5WTF and Mark VK5QN stepping in to give us a hand. Also on site was Mark VK5QI (Payload), Grant VK5GR (Balloon) and Will VK5AHV (Balloon). The team laid everything out and commenced assembling both the balloon train and the filling apparatus. At the same time, Grant VK5GR started up his frist time chase vehicle and coaxed all of the linked software systems to life. Thanks to some loaned antennas from Matthew VK5ZM and LoRa receivers from Mark VK5QI, Grant was able to establish a full telemetry and tracking suite in just a matter of days to help assist with the chase. Marcus filmed the proceedings too and you can see a short timelapse here of inflating the balloon. Meanwhile, Mark VK5QN and Mark VK5QI (yes that did get confusing) assembled the balloon train. Mark VK5QN with his climbing and scouting background did a professional job of tying the balloon train together. You are most welcome to come again Mark! Finally the time came for liftoff. Mark VK5QI checked in with ATC Melbourne and we were given our clearance to fly. The team raised the balloon train and was thankful that we had almost zero ground winds. Mark did a final check that all the payloads were transmitting using a new handheld flight status monitor he had been working on and gave the the green light to commence countdown. Grant VK5GR then released the balloon and we witnessed a near text book launch. As it climbed, the balloon hit it’s ascent target speed of 5m/s and everything looked good for a successful flight. The ground teams then scrambled to pack everything away and get rolling. It was going to be a long chase, with the landing zone predicted to be up in the north eastern Barossa Valley, and a detour around the River Murray required past Bow Hill and up to Blanchtown so that delays on the river car ferrys could be avoided. Meanwhile 58km to the north west, the ground tracking crew of Peter VK5KX and Darin VK5IX were awaiting signal aquisition as the balloon cleared the horizon. They had lots of signals to track this flight, including the 100 Baud RTTY, the LoRa Telecommand system and two Wenet Imaging payloads. Peter again setup his automated tracking antenna (seen on the previous week’s flight) and with Darins help was able to collect and upload to the internet the image signals from both payloads. Meanwhile, back in the two chase cars, Marcus VK5WTF, Mark VK5QI and Will VK5AHV headed out first and made the dash up to the valley. Mark VK5QN and Grant VK5GR had a slightly slower start, as they had to first drop the gas trailer at a staging point in Younghusband before they too could join the chase. This was the first time the balloon and been flown this far NE of Adelaide so it was great to see some different angles of the state. The weather was nearly perfect as well with hardly a cloud in the sky. 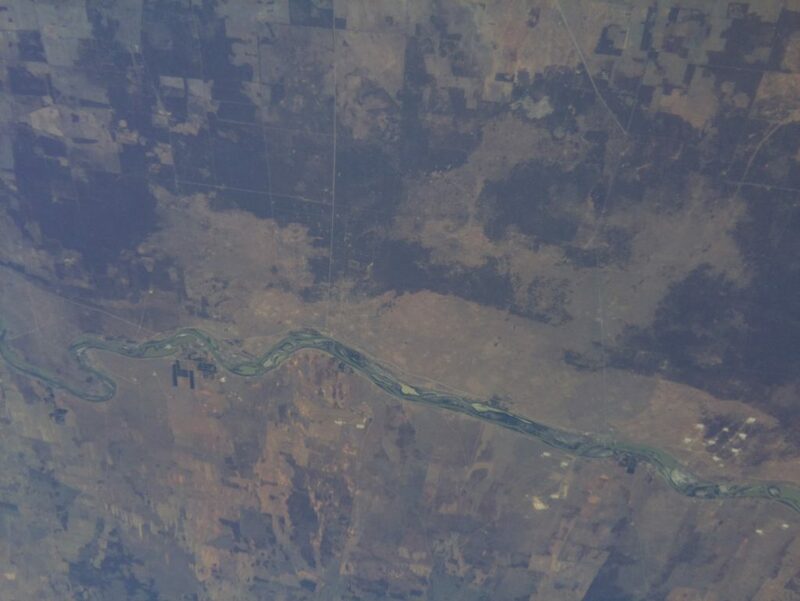 These photos were taken by the AREG Wenet payload with an outward facing camera. One of the last photos actually captured a shot of Mark VK5QI’s chase car as the team was fortunate to be in visual range of the landing. Grant’s team wasnt quite so lucky due to a software issue involving timezones and the prediction tools and he didnt make it to the landing zone until about 5 minutes after it landed. Once the balloon landed, both teams met up with the local land owner before being given permission to drive in and pick up the payloads. 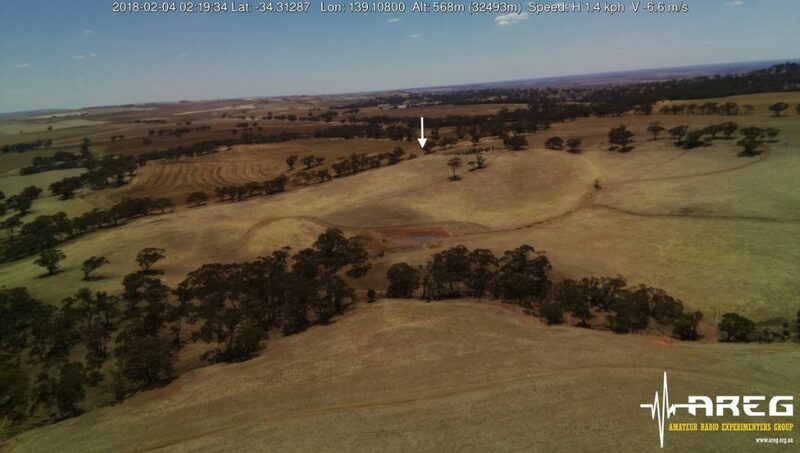 We were very lucky that the balloon landed approximately 100m from the access track in an empty stubble field. Definitely one of the easier recoveries of recent times! After we bid farewell to the land owner it was off back home – of course via another bakery (this time in the main street of Truro). Mark’s chase team had the luxury of being able to head straight back to Adelaide. Meanwhile Grant had to return to Younghusband to pick up the gas bottles and trailer. For the VK5GR team it was nearly a 600km 10.5hr round trip this time. Horus 47 flew an interesting course this time. This is a rather uncommon flight track for the AREG team. Again many amateurs from across the state got involved in telemetry collection. We wish to thank everyone who took part as you all help make the chase and recovery more successful. So that marks the end of the story for the Southern Hemisphere Space Studies balloon launch program for 2018. We hope everyone had a great time and again thank everyone who contributed or participated in making the flights possible! Acknowledgements: Thanks to VK5QI, VK5QN, VK5GR, VK5WTF, VK5KX, VK5IX, VK5AHV and SHSSP for all the material in this report. This entry was posted in Horus, Project Horus and tagged hab, Project Horus, shssp18 by VK5GR. Bookmark the permalink.